When Red Sox all-star David Ortiz snapped a selfie of himself with the President last week (which turned out the be a Samsung marketing stunt), White House staffers were not too impressed. Turns out, it is frowned upon to use the President’s likeness to promote a product without his knowledge (who would have thought?). 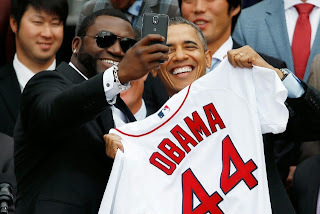 So, if you’ve ever dreamed of snapping a selfie with the leader of the free world, you can thank David Ortiz for ruining your fun.